can you believe it? 297 downloads and they're STILL coming! Yep, as promised here is my second batch of very large textures. You know what? I think this batch is better than the first. So if you didn't like that, at least give this one a try. I mean, with 70 textures, how can you go wrong? There's bound to be something you'll like in there. Okay, now guys. I really don't need comments (unless you want to say something particularly flattering :P ) because mediafire has this awesome feature which tells you how many times the file has been downloaded. All I ask is for more people to download this than last time. And yes, that will be hard because it has 297 downloads as of about a minute ago. 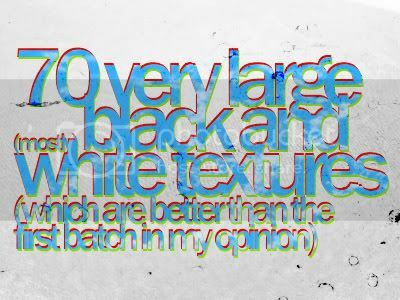 I love the effect in the text... How do you do it??? is it a cloudy texture or what??? Do you mind explain me, please!!! Of course, i take the textures!!! I made a green dropshadow. I set the layer mode of that to 'normal' and 100% opacity and then set the distance to '2' and the size to '0'. I did the same things with the inner shadow, but with red instead of green obviously. yeah, me too. I figured it was about time to stop waiting around for people to make me the textures that I want and to make them myself. There are some gigantic recycled paper scans you might want to take a look at that surely impressed me. They are amazing! Thank you so much for sharing! It's really, really nice batch, and I can't wait to use them. 8]]]] Thank you! Snagged these and have added you to my resource post. Thanks for sharing. Ooh! Another batch. Taking this. Thanks! 70?! Hmmm gotta check that out. Thanks!